Though I had read Dragon for sometime beforehand, issue #68 (December 1982) was the first one I ever received as part of my subscription. As it turned out, I got two copies of every issue during that subscription owing to an error at TSR, which resulted in one copy being sent to me in Baltimore, Maryland and another being sent to me in Baltimore, Mississippi, but, since it's the zip code (which was correct on both copies) that matters when it comes to postal delivery, not the putative state, I wound up with two of every issue for twelve months. What was cool about this state of affairs, beside the fact that I could give away copies to friends and look like Mr Magnanimity, was that I could also disassemble issues with impunity, adding particularly favored articles to my "Dungeon Master Binder," where I kept stuff like my maps, NPC write-ups, and critical hit charts (also from Dragon). 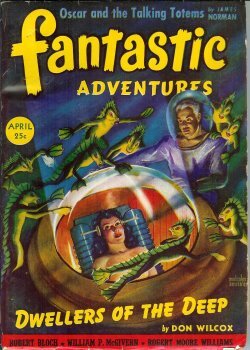 Among the articles from issue #68 that I removed from my extra copy and carried around was "Thrills and Chills: Ice Age Adventures" by the underrated Arthur Collins. The article, which was lengthy, re-imagined your typical D&D fantasy setting as a prehistoric Ice Age one. For some reason, the idea of adventuring in a land of woolly mammoths and saber-tooth tigers really appealed to me at the time, though I never actually used the article in play. I bring all of this up as an introduction to Manly Wade Wellman's short story, "Hok Visits the Land of Legends." First published in the April 1942 issue of Fantastic Adventures, it's part of the larger saga of Hok, a prehistoric man living during the Ice Age, whom the short story describes thus: "Hok the Mighty, strongest and wisest and bravest of the Flint Folk whose chief he was." The story begins just as Hok has decided to go alone to hunt the great mammoth Gragru. On a cloudy gray day, not too cold, he spoke from his cave-door in the bluff above the huts. "I go on a lone hunt," he told the tribe. "It will be several days, perhaps, before I return. In my absence, Zhik is your chief." Then he gave his handsome wife Oloana a rib-buckling hug, and told young Ptao to grow in his absence. He departed along the river trail, heading south for mammoth country. When, after a long search, Hok finds and engages Gragru in battle, he finds that the beast is hardier than he expected. Though wounded by his attacks, the mammoth flees and Hok pursues him, following the trail of his blood. After several more days of tracking, Hok comes upon the dying mammoth and prepares to kill him. "Gragru, I am honored by this adventure," he wheezed. "Eating your heart will give me strength and wit and courage beyond all I have known. You will live again in me. Now, to make an end." He kicked off the snowshoes, so as to run more swiftly at Gragru's sagging hindquarters. But, before he moved, Gragru acted on his own part. He stretched his trunk backward to the shaft in his wound. Hok relaxed, smiling. "What, you would die of your own will? So be it! I yield you the honor of killing Gragru!" Not long thereafter, however, the ground crumbles beneath the mammoth carcass and it slides down into a strange valley. The valley seemed to throb and steam. He made out rich leafage and tall tree-summits far below. One or two bright birds flitted in the mists. Hok grimaced. "Summer must sleep through, the cold, like a cave-bear," he decided. "I will go down, and look for Gragru's body." There were shoots and shrubs and hummocks for him to catch with hands and feet, or he would have gone sliding again. The deeper he journeyed, the warmer it became. Now and then he hacked a big slash on a larger tree, to keep his upward trail again. Those trees, he observed, were often summer trees, lusher and greener than any he had ever seen. "Is this the Ancient Land of safe and easy life?" he mused. This valley is, of course, inhabited, not only by creatures Hok calls "nightmares" (relict dinosaurs) but also a strange race of men. This is the Land of Legends mentioned in the story's title and where Hok's true adventure begins. I have little doubt that the idea of a fantasy tale starring a prehistoric man seems strange to a lot of people, even uninteresting. The truth is that Wellman is a terrific writer, superb not only at creating compelling characters but at weaving history, folklore, and imagination into a delightful pulp adventure, just as he did with his stories of Silver John the Balladeer. Wellman isn't as widely known an author as he ought to be, though Gary Gygax lists him in Appendix N as having had an influence over AD&D and Karl Edward Wagner (creator of Kane) was also a great admirer of his work. His Hok stories have recently been collected into a single volume and are finally back in print. I'm very fond of them myself and think they're well worth investigating if you've never read them before. I enjoyed the Hok stories quite a bit. I do wish Paizo would release these and the rest of their fiction line in e-book format; I'm trying not to burden my groaning bookshelves much more than I have to. I think a collection of MWW's John Thunstone's stories is due out in a couple of months. I've never read a Thunstone story so I'm interested in checking it out.